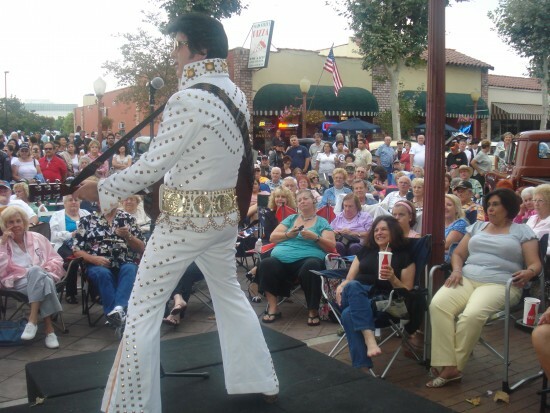 Larry D Sanders is one of the top Elvis impersonators in southern California.Bringing to you the sound,the excitement,the fun and the presence of Elvis Presley in concert.Performing hits from the 50s, 60s and the 70s. Available for Weddings, birthdays, corporate, private and Fundraisers. You can expect and be assured of a first class re-creation of Elvis in concert.Larry D Sanders will make your next special event one which will be remembered for years to come. in a word Larry was great. He arrived on time we pulled off the charade of being a coworker and when he was all set up he came out as Elvis and thoroughly entertained the ladies in the audience. Thank you Louis.It was an honor for me to perform for your wife, family and friends. Honestly, this was the best performance of any impersonator I’ve ever had the pleasure to experience! I lived a fantasy as though “Back to the Future” in the 60’s with Elvis in person- touchable, real, and alive before me. Larry’s moves, voice, and glib remarks were so “Elvis” all over again. And oh boy, what a grand time we all had at my mother’s 96th birthday party. Who says old folks can’t get into the swing of things! Ha! Atria Golden Creek has been buzzing for weeks about the best entertainment they ever had! As for me, my friends and family--WOW! We danced, swooned and screamed for more! A memorable experience to say the least. My only question is ..." Why did it have to end?" Thank you Rita for the very kind words I appreciate that so very much.Your Mom was so energetic it blew me away.It was a great venue and great people to perform for.Thank you Rita for having me perform at this very special occasion. 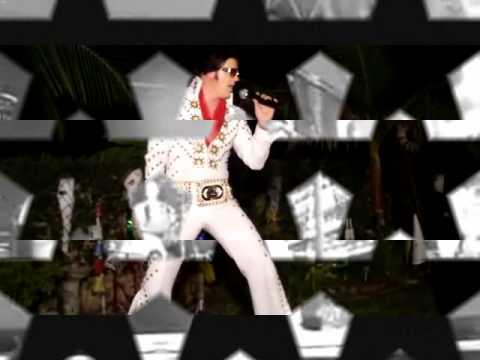 Very professional Elvis impersonator! Outstanding performance with excellent guest interaction. Great white Elvis attire and emulator of the King! Voice was wonderful and everyone in crowd was thrilled. Would hire again and highly recommend! Elvis delivered! He was punctual, his outfit was awesome, he was very personable, he sang great, his performance was spot on and stayed for pictures after! Thank you very much Jessica, I appreciate your review very much. your family and friends were a lot of fun. You put on a great party Jessica, thank you for everything. Larry Sanders is 5 Stars, 10 out of 10, A+ and any other rating scale you can think of, performer. 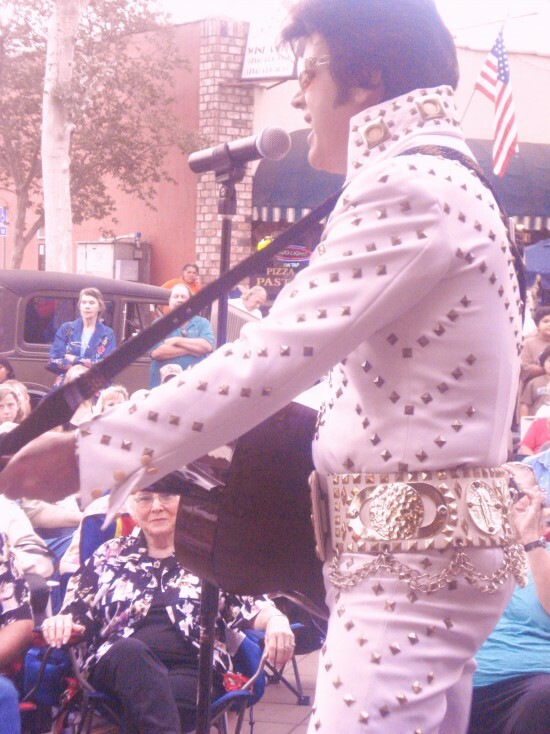 He engaged our guests, sounded great, and performed with the mannerisms of Elvis even better than I could have expected. 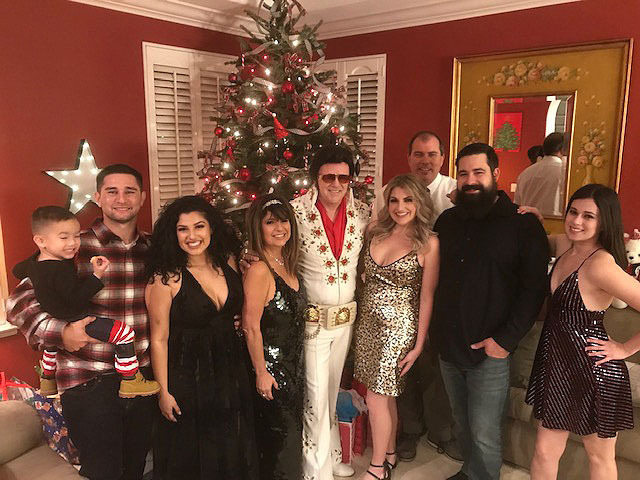 Our guests have been sending us texts and emails telling us how much they enjoyed "Elvis" at our Christmas Party, so glad we chose him to perform! Thankyou very much Michael for taking the time and leaving me a great review. You put on a fantastic party and it was so much fun to perform for such a fantastic and participating crowd. Cheers! and a Merry Christmas and a very happy new year to you. Mr. Sanders was the perfect addition to our event! He arrived on time, he was very polite and professional and he performed a great show. The ladies at our event loved it. Thank you so much! He was great with the children and adults. Very professional. Prompt and awesome. Everyone expected mariachis, they were surprised! Forget the food & drink! 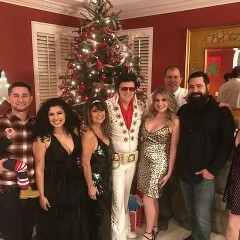 Elvis made the party. My guests are still talking about him. Larry, arrived on time, put on a great show, and we all had a wonderful time! Larry is a wonderful entertainer and captured the heart of each girl there celebrating a small class reunion. What I appreciated almost more than how amazing he was, as a business person, he is a great communicator. He was proactive, on time, gave all of his time, and the consummate professional. I recommend him very highly, your needs for your event are clearly, his top priority. Thanks again Larry, it was my pleasure! 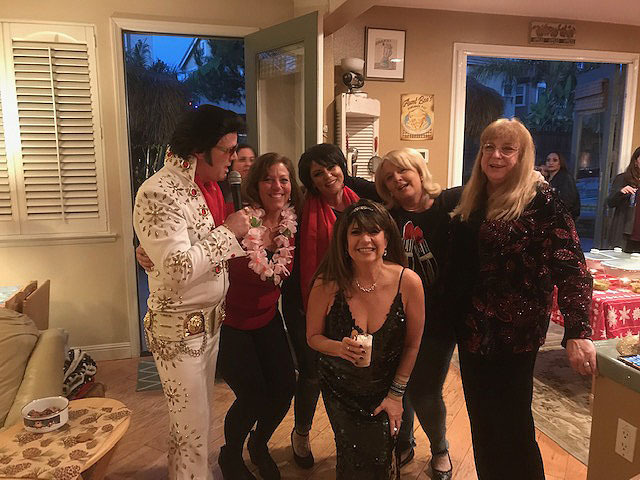 Hiring an Elvis impersonator I discovered is difficult because there are quite a few guys that do this gig, but when you HAVE to make sure you get the right Elvis for your Mom's 80 bday, the pressure is on not to screw it up. I selected Larry Sanders because he was professional and prompt to my questions , and he offered "extras" which I thought would be nice. However, I was not prepared AT ALL on how good Larry is. First off, the guy really morphs into Elvis, with the voice, stance, mannerisms, and stage presence! He took our dinner party of 30 conservative family members and had us on our feet! This performance was really mesmerizing, and immediately after the very first song I knew I made the right decision to hire him. Additionally Larry has a playful interaction with the crowd that had us laughing. He is the total package, and I would highly recommend him to anybody. Larry : Thank You for making my Mom's birthday the best! She is still talking about it days later! Larry is one of the best professional entertainers I have ever met. Not only is he an awesome Elvis, he is a very personable guy who is great at his craft. My wife Cheryl and I had Larry perform our 40th anniversary marriage vow renewals on the beach at the Del Coronado Hotel in San Diego, at sunset, in December and he was the King of the beach. We had a small ceremony that was not only enjoyed by us and our family, but all the passersby as well. He brought just the personal touch we were looking for. He also had some great vows for us and we danced to a few great Elvis songs. Our 4 year-old granddaughter, who is special needs, enjoyed Larry too. Thank you Larry for making our small event HUGE Baby! Thank you VERY much!! I surprised my wife and friends for her birthday party this past August 22, 2015 with Larry D. Sanders. He was fantastic. His interaction with the audience was great and everyone, called us after to rave about how great Larry was and to say that this was the best party ever. Larry D. Sanders really made this a very special night. Thank you Steve.it was an honor to be part of your wife's birthday celebration.performing for a great crowd made it a lot of fun. Larry showed up on time. Looked great. And performed an excellent show. I would highly recommend him to anyone. Extremely professional and helpful throughout the process. Did a great job as Elvis. Everyone enjoyed his singing. Would hire him again in needed. Thank you. Larry did an amazing job as Elvis! He was on time, professional and so easy to work with. He was adaptable when we had a starting time problem. His costume was pristine, and his presentation so well done. My 102 year old Mother loved him. I would recommend him without reservation!!! Thank you Sharon.I appreciate the kind words very much.I was very honored to be part of the very special day. Your Mother was amazing and a lot of fun,Great party all around.Thank you again.Larry. Excellent performance!! Larry did a great job!! Larry came early and stayed late! He gave a heat performance and drew the audience into his performance. He was funny and really entertained our friends at my wife's birthday event. Thank you so much for the kind words.Its always a pleasure to perform for great people like you and your wife.You were very kind and helpful to me and you throw a great party.Thank you for allowing me the honor of being part of your wife's 50th party.Sincerely.Larry. 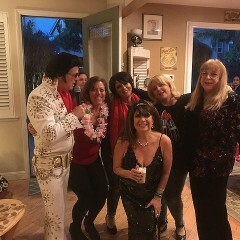 Elvis was a hit at 50th birthday party. This was the first I used Gigsalad and chose Larry Sanders, he was entertaining, professional and gave a great show that everyone of all ages enjoyed. Wonderful show, everyone loved ELVIS! Larry was great, looked and sounded just like we imagined Elvis would .Larry kept us informed and communicated frequently leading up to event. He showed up at event early and set up discreetly, no one even knew that Larry was Elvis. His sound system and costume were excellent. This was a birthday party for my 80 year old mother and most of her friends were of same age and they all just loved Larry's humor and flirting. Show was approx. 40 minutes and Larry was most gracious posing for pictures after show. I would be happy to use Larry's services again. Thanks Larry! I had interviewed half a dozen Elvis impersonators & had listened to most of them, but you are the one that stands out in all of them. 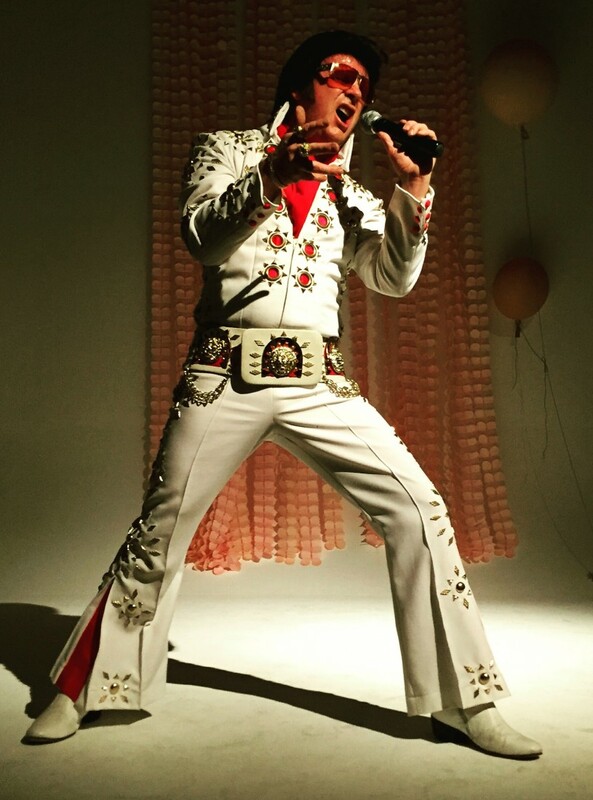 I did not regret choosing you, you're the perfect Elvis impersonator for my 50th Birthday party. What a FABULOUS show Larry gave ... everyone loved him ... he worked the crowd like we were in Vegas ... everyone felt special ... he was sooo good the hostess requested an additional hour ... that speaks doesn't it! My girlfriends really liked you & we had a good time. I guess some of the husbands envy you secretly!!! HAHAHA. This will be short but from the heart, you're so cool, warm hearted & very professional. I had welcomed you in my world & I hope you'll remember me! Thank you very much!!! You will get to feel what it may have been like to go see Elvis in concert.you may also be one of the lucky few and receice a scarf or teddy bear from Elvis,either way you will leave knowing you have just seen one of the best Elvis entertaines you will probably ever see. World Class Elvis impersonator Larry D Sanders is one of the top rated Elvis performers in the business. Bringing to you the sound,excitement,and the presence of Elvis Presley in concert. Performing all the Elvis Presley hits from the 50s,60s and the 70s. Some have said of Larry's Elvis Tribute" A truly masterful and exciting performance of Elvis in concert". Larry has performed his Elvis Tribute in Las Vegas many times to thousands of Elvis fans and always leaves with excellent reviews. You can expect and be assured of a first class re-creation of Elvis in concert Larry D Sanders will make your next special event one which will be remembered for years to come. We use top fo the line professional sound equiptment and wireless mics.We have lights and fog machines available also.We use the best because your event is most likely very special to you.you dont want some guy showing up with a boombox for backing tracks.